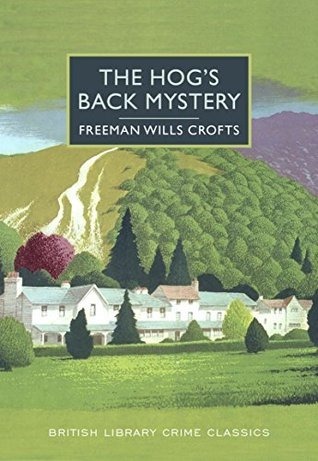 My Book Notes: The Hog’s Back Mystery (Inspector French #10) by Freeman Wills Crofts. The British Library Publishing Division, 2015. Format: Kindle edition. File size: 930 KB . Print length: 327 pages. Originally published in 1933 by Hodder & Stoughton. With an Introduction by Martin Edwards, 2015. ASIN: B00UINPD1U. ISBN: 978-0-7123-5797-5. Product details: Dr James Earle and his wife live in comfortable seclusion near the Hog’s Back, a ridge in the North Downs in the beautiful Surrey countryside. When Dr Earle disappears from his cottage, Inspector French is called in to investigate. At first he suspects a simple domestic intrigue – and begins to uncover a web of romantic entanglements beneath the couple’s peaceful rural life. The case soon takes a more complex turn. Other people vanish mysteriously, one of Dr Earle’s house guests among them. What is the explanation for the disappearances? If the missing people have been murdered, what can be the motive? This fiendishly complicated puzzle is one that only Inspector French can solve. My take: Ursula Stone, invited by her friend Julie Earle, comes to spend a fortnight at St. Kilda while Marjorie Lowes, Julie’s sister, is also enjoying there a few days. Ursula is not related with the two sisters, but the three had been inseparable at school, and they had kept in touch since then. Julie Earle and her husband, a retired doctor, have settled down in the heart of wild Surrey, and even though Julie had made many friends in the surroundings, she was leading a solitary life. Having two visitors simultaneously was a pleasure she had not enjoyed for a long time. Dr James Earle, older that his wife, came into a certain amount of money, which enabled him, at his sixties, to leave his practice in the hands of his partner Dr Campion, and bought St Kilda, intending to devote his time to write a book. But Ursula soon realises that her friend’s marriage doesn’t appear to be working well, and one day she finds out Dr Earle is spending a day in London with another woman while he was supposed to be at his club playing golf in the morning and bridge in the afternoon, and he was not expected back at home until dinner. Things take an unexpected turn one evening when Dr Earle disappears without trace. He was last seen sitting comfortably at home reading his newspaper in slippers. And he was not dressed or wearing appropriate shoes to go anywhere. Shortly after, some other mysterious disappearances take place and Inspector French is called in to investigate. Freeman Wills Crofts was born in Dublin in 1879 and worked in railway engineering. In 1919, during an absence from work due to a long illness, Crofts wrote his first novel, The Cask (1920), which established him as a new master of detective fiction. He is best remembered for his favourite detective, Inspector Joseph French, who was introduced in his fifth book, Inspector French’s Greatest Case (1924). In 1929, he abandoned his railway engineering career and became a full-time writer. Crofts was esteemed, not only by his regular readers, but also by his fellow writers of the so-called Golden Age of Detective Fiction. Agatha Christie included parodies of Inspector French alongside Sherlock Holmes and her own Hercule Poirot in Partners in Crime (1929). Raymond Chandler described him as ‘the soundest builder of them all when he doesn’t get too fancy’ (in The Simple Art of Murder). His attention to detail and his concentration on the mechanics of detection makes him the forerunner of the ‘police procedural’ school of crime fiction. However, it has also given rise to a suggestion of a certain lack of flair – Julian Symons describing him as of ‘the humdrum school’. This may explain why his name has not remained as familiar as other more colourful and imaginative Golden Age writers, although he had 15 books included in the Penguin Books ‘green’ series of the best detective novels and 36 of his books were in print in paperback in 2000. (Several sources and Wikipedia). Considered by many among the best in the series, The Hog’s Back Mystery finds Crofts at the height of his career as a writer of detective novels. Admittedly, I’ve been very pleased of having read it. A truly entertaining book, nicely written and carefully crafted that manages to keep the reader’s attention until the last pages. Inspector French is a compelling and agreeable character. And the story is a good example of ‘fair play’, where the reader has access to the same clues and information with which the detective manages to solve the mystery. It’s interesting to highlight that on the first pages of the story one doesn’t even know if there will be a crime, what kind of crime will occur or who will the victim or victims be. Besides, there’s is an interesting shift on the perspective of the narrator, once the investigation begins to unfold and Inspector French makes his appearance. In the end, the reader will end up immersed in the plot and will find it difficult to put aside the book In a sense it was a very pleasant surprise and I’m looking forward to reading more of his books in this series. Some of them are already on my TBR pile. If you like a good mystery puzzle you will certainly enjoy this one. Highly recommended. Here you may find my review of Crofts’ Mystery in the Channel (Inspector French #7). The Hog’s Back Mystery has been reviewed at Crime Review, Classic Mysteries, His Futile Preoccupations ….., Noah’s Archives, Shiny New Books, The Invisible Event, ‘Do You Write Under Your Own Name?’, Mystery File, crossexaminingcrime, and The Passing Tramp, among others. Ficha del libro: El Dr. James Earle y su esposa viven en un cómodo aislamiento cerca de Hog´s Back, una cresta en North Downs en el hermoso campo de Surrey. Cuando el Dr. Earle desaparece de su casa, acude a investigar el inspector French. Al principio, sospecha una simple intriga doméstica, y comienza a descubrir una red de enredos románticos debajo de la pacífica vida rural de la pareja. El caso pronto toma un giro más complejo. Otras personas desaparecen misteriosamente, uno de los huéspedes de la casa del Dr. Earle entre ellos. ¿Cuál es la explicación de las desapariciones? Si las personas desaparecidas han sido asesinadas, ¿cuál puede ser el motivo? Este rompecabezas diabólicamente complicado es algo que solo el inspector francés puede resolver. Mi opinión: Ursula Stone, invitada por su amiga Julie Earle, acude a pasar quince días en St. Kilda, mientras que Marjorie Lowes, la hermana de Julie, también disfruta unos días allí. Ursula no está relacionada con las dos hermanas, pero las tres habían sido inseparables en la escuela y se habían mantenido en contacto desde entonces. Julie Earle y su esposo, un médico retirado, se instalaron en el corazón de Surrey, y aunque Julie había hecho muchas amistades en los alrededores, llevaba una vida solitaria. Tener dos visitas simultáneamente era un placer del que no había disfrutado en mucho tiempo. El Dr. James Earle, mayor que su esposa, alcanzó a hacerse con una cierta cantidad de dinero, lo que le permitió, a los sesenta años, dejar su práctica en manos de su compañero, el Dr. Campion, y compró St. Kilda, con la intención de dedicar su tiempo a escribir un libro. Pero Ursula pronto se da cuenta de que el matrimonio de su amiga no parece estar funcionando bien, y un día descubre que el Dr. Earle pasa un día en Londres con otra mujer mientras se suponía que estaba en su club jugando al golf por la mañana y al bridge por la tarde, y no se esperaba que regresara a casa hasta la cena. Las cosas toman un giro inesperado una noche cuando el Dr. Earle desaparece sin dejar rastro. Fue visto por última vez sentado comodamente en casa leyendo su periódico en zapatillas. Y no estaba vestido ni llevaba zapatos adecuados para ir a ninguna parte. Poco después, se producen otras desapariciones misteriosas y se llama al inspector French para que investigue. Freeman Wills Crofts nació en Dublín en 1879 y trabajó como ingeniero ferroviario. En 1919, durante una baja laboral debida a una larga enfermedad, Crofts escribió su primera novela, The Cask (1920), que lo consolidó como un nuevo maestro de la novela policíaca. Es más recordado por su detective favorito, el inspector Joseph French, quien fue introducido en su quinto libro, Los grandes casos del inspector French (1924). En 1929, abandonó su carrera como ingeniero de ferrocarrilies y se convirtió en escritor a tiempo completo. Crofts fue valorado, no solo por sus lectores habituales, sino también por sus compañeros escritores de la llamada Edad de Oro de la Ficción Detectivesca. Agatha Christie incluyó parodias del inspector French junto a Sherlock Holmes y su propio Hercules Poirot en Partners in Crime (1929). Raymond Chandler lo describió como “el mejor constructor de historias de todos ellos cuando no se pone demasiado elegante” (en The Simple Art of Murder). Su atención al detalle y a los mecanismos que hacen posible la investigación lo convierten en precursor de la “escuela del procedimiento policial” de la novela policíacal. Sin embargo, también ha dado lugar a una sugerencia de cierta falta de estilo: Julian Symons, que lo encuadra dentro de “the humdrum school“. Esto puede explicar por qué su nombre no ha resultado tan familiar como otros escritores más coloridos e imaginativos de la Edad de Oro, aunque tenía 15 libros incluidos en la serie “verde” de Penguin Books de las mejores novelas policíacas y 36 de sus libros continuaban publicados en edición de bolsillo en el 2000. (Varias fuentes y wikipedia). Esta nueva edición del clásico de Croft The Hog’s Back Mystery, la décima entrega de su serie de treinta libros protagonizados por el Inspector French, trae una introducción del experto en novela policíaca Martin Edwards, quien comenta sobre este libro: “es una amena novela de detectives que presenta un ingenioso enigma de un asesinato en Surrey. … Este libro demuestra su compromiso de “juego limpio” con sus lectores, hasta tal punto que, cuando el inspector Joseph French de Scotland Yard finalmente resuelve el misterio, se recuerda al lector cada página en donde se sembró una pista “. Considerado por muchos de los mejores de la serie, The Hog’s Back Mystery encuentra a Crofts en el apogeo de su carrera como escritor de novelas policíacas. Es cierto que estoy muy contento de haberlo leído. Un libro verdaderamente entretenido, bien escrito y cuidadosamente construido que logra mantener la atención del lector hasta las últimas páginas. El inspector French resulta ser un personaje convincente y agradable. Y la historia es un buen ejemplo de “juego limpio“, donde el lector tiene acceso a las mismas pistas e información con las que el detective logra resolver el misterio. Es interesante destacar que en las primeras páginas de la historia uno ni siquiera sabe si habrá un delito, qué tipo de delito ocurrirá o quién será la víctima o las víctimas. Además, hay un cambio interesante en la perspectiva del narrador, una vez que la investigación comienza a desarrollarse y el Inspector Francés hace su aparición. Al final, el lector terminará inmerso en la trama y le resultará difícil dejar de lado el libro. En cierto sentido, fue una sorpresa muy agradable y estoy deseando leer más de sus libros en esta serie. Algunos de ellos ya están en mi pila de libros pendientes. Si le gusta un buen misterio, seguramente disfrutará de este. Muy recomendable. Usted va a poder encontrar aquí mi reseña de Mystery in the Channel (Inspector French #7) por Freeman Wills Crofts. Acerca del autor: Freeman Wills Crofts (1879-1957) fue uno de los escritores más sobresalientes de la Edad de Oro de la novela policíaca británica. Escribió más de treinta novelas y fue muy admirado por sus compañeros, incluidos Agatha Christie y Raymond Chandler. Nació en Irlanda, hijo de un médico del ejército británico. Después de una formación y educación religiosa, Crofts pasaría a convertirse en ingeniero de ferrocarriles, un trabajo que conservó durante la mayor parte de su vida laboral. Pero no fue hasta que se recuperó de una grave enfermedad, en 1919, que Crofts comenzó a intoducirse en el círculo literario que se convertiría en la “Edad de Oro de la Novela Policíaca”. El resultado fue su primera, y posiblemente su mejor novela, The Cask. Publicada en 1920 por Collins y tuvo un éxito inmediato en casa y en el extranjero. Era, y sigue siendo, un libro de referencia importante. La formación de Crofts, como ingeniero de ferrocarriles, aparece con frecuencia (con demasiada frecuencia para algunos) a lo largo de sus novelas. Su mejor cualidad es también su mayor defecto, dependiendo del punto de vista. La gran atención por el detalle, aunque admirable, puede ir en detrimento de personajes ligeramente superficiales o endebles. Dicho esto, sus libros están bien ideados y capturan perfectamente el estado de ánimo y la esencia de la época. El inspector French apareció por primera vez en su quinta novela, Los mejores casos del inspector French, publicada en 1925 por Collins y fue el comienzo de una saga de 30 años durante la que Crofts publicó una novela de French al año. Tras otra enfermedad, Crofts falleció en 1957 poco después de publicar su última novela, Anything to Declare? publicada por Hodder & Stoughton. Si bien es posible que Crofts no sea el máximo representante “literario” de la novela de detectives, fue y sigue siendo una figura importante e influyente en el desarrollo de ésta tal y como la conocemos hoy. (Fuente: Classic Crime Fiction, mi traducción libre).